The UW campus in Seattle and branch campus in Bothell both received scores among the highest 15 in the nation. However, "It's not like anybody is performing extraordinarily well," said the executive director of USC's Race and Equity Center, which wrote the report. Washington is the second-best state in the nation for black student access and equity at its public colleges and universities, according to a report from the University of Southern California. The report, released Tuesday from USC’s Race and Equity Center, highlighted the University of Washington’s branch campus in Bothell as among the highest in the U.S. for its student body that demographically reflects the state’s share of black young adults and for helping black students graduate at nearly the same rate as their peers. 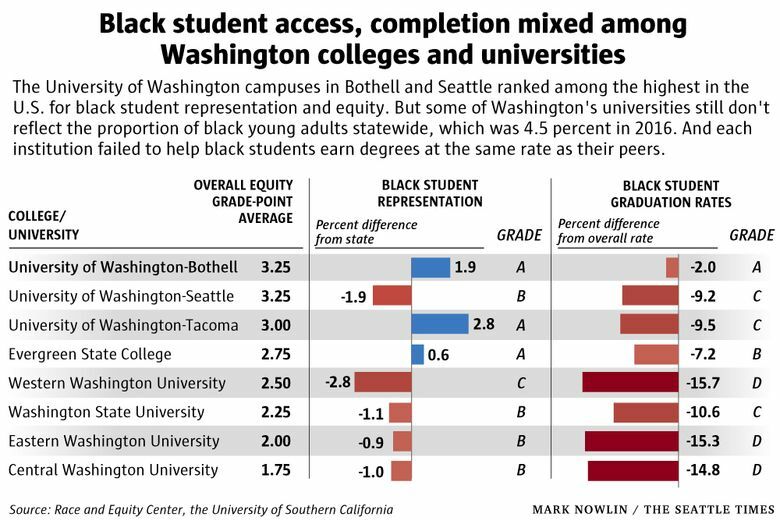 The UW campuses in Seattle and Tacoma also earned high nods for black student enrollment, but both received less-than-stellar grades for failing to support more black students through graduation. Rickey Hall, UW’s vice president for minority affairs and diversity, hadn’t reviewed the report Monday, but he said the federal education data that the authors used does not fully capture students of mixed race, international students and transfer students. “If we added those in, we’d probably look even better,” Hall said. In the USC report, co-authors Shaun Harper and Isaiah Simmons measured how well the share of black students at public colleges and universities reflected the proportion of black young adults statewide, which in Washington was 4.5 percent in 2016. The authors also examined the breakdown of black student enrollment by gender, whether black graduation rates mirrored the larger student body and the ratio of black faculty members to black students. The report graded the four measures on an A-F scale, then calculated an equity index — much like a grade-point average — for each institution and state. Education Lab is a Seattle Times project that spotlights promising approaches to persistent challenges in public education. It is produced in partnership with the Solutions Journalism Network and is funded by a grant from the Bill & Melinda Gates Foundation and City University of Seattle. Learn more about Ed Lab. Washington earned an index of 2.59, second only to a score of 2.81 in Massachusetts. California was third with a score of 2.46. Harper, executive director of USC’s Race and Equity Center, compared those top scores with a high-school student who bragged about having a 2.46 grade-point average on a 4.0 scale. That would equate to a B-minus or C-plus letter grade. “It’s not like anybody is performing extraordinarily well,” Harper said. The flagship UW campus in Seattle and branch campus in Bothell both received an index of 3.25, among the highest 15 in the nation. 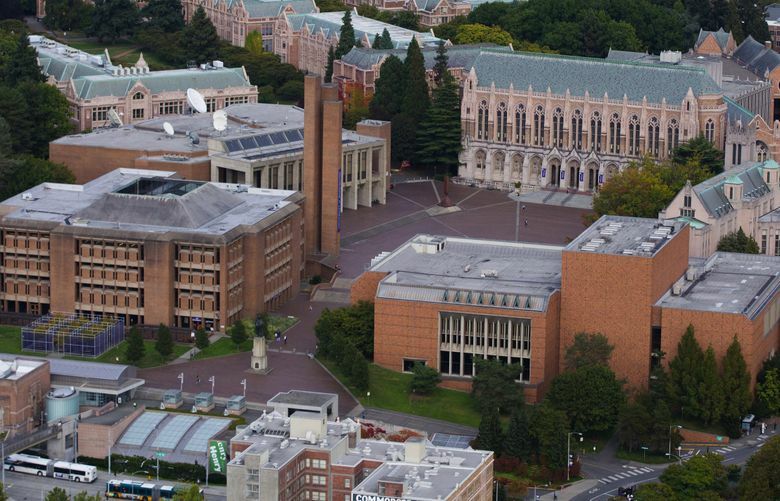 The Seattle campus earned an A for enrolling black male and female students at close to equal rates and earned another A for having at least one black faculty member for every 13 black students. But it got a C for completion, as the percentage of black students who graduate within six years trails the overall student body by nearly 10 percentage points. UW-Bothell, meanwhile, earned an A in all measures except for a D for its black student-to-black- faculty ratio of 71-to-1. Harper, who plans to update the report in four years, noted the current version does not include an assessment of campus culture, which can either help black students stay through graduation or push them away early. Neal Morton: 206-464-3145 or nmorton@seattletimes.com; on Twitter: @nealtmorton.